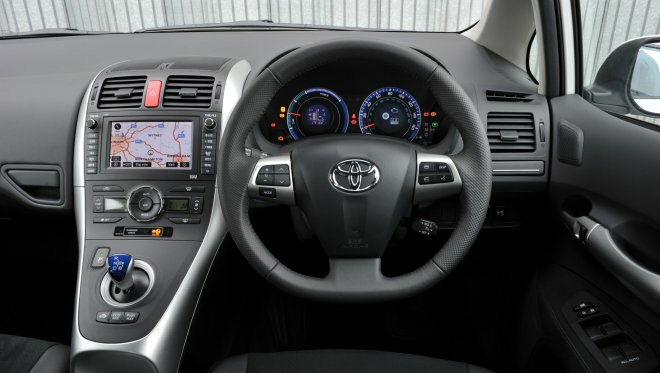 Down by the stubby gear selector in the Toyota Auris Hybrid Synergy Drive you’ll find a row of buttons marked EV, ECO Mode and PWR Mode. Prodding one will change the way this green car drives, and prodding it again will switch back into normal mode. Evidently normal doesn’t merit a button of its own, perhaps because it’s the state in which the car wakes up, no matter what mood you left it in at the end of your previous journey. I was naturally curious to sample EV or electric vehicle mode, which allows the Auris hybrid to creep around silently on battery power alone, endangering blind people and unwary children with its Ninja stealth. You’ll have to stay below 30mph, though, and operate the throttle wearing soft slippers to remain a threat to the infirm. Asking for too much speed or a modicum of acceleration will trigger an admonishing beep and a switch back to normal mode, with engine. You will also need to set off with a fullish battery and not have far to go, because the maximum EV range feels like you might easily mark it out on the road with a tape measure. So EV mode is unfortunately a little bit of a gimmick. 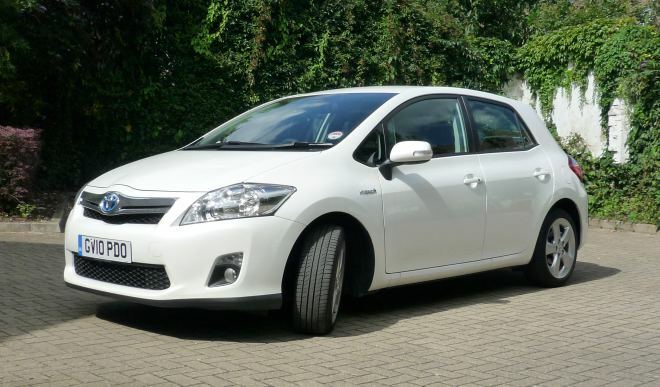 Not something the Auris hybrid is good at, just something that sounds good. What about Eco mode then? This setting softens the throttle response and beefs up the brake regeneration, increasing the amount of energy recaptured when slowing down. By muting and smoothing driver inputs, Eco mode is designed to save fuel. The change in regen is so subtle I could barely detect it, but the change in the accelerator map is impossible to miss. It feels as if a taut steel cable linking engine to pedal has been removed and replaced with a long and floppy length of elastic. Try to dart out onto a busy roundabout and you’ll scare yourself witless as the car responds with all the alacrity of a teenager sent to tidy their room. I like to save fuel, of course, but I couldn’t live with Eco mode. It would be like trying to maintain a diet of lentils in the presence of steak and chips. Power mode, as the name suggests, is yang to the Eco mode’s yin. Rather than being reluctant to rev and feeling like a soggy pudding, the Auris hybrid will respond crisply to every dip of your right toe with as much vim as it can muster. And it can muster 138bhp when the motor and engine combine. It feels, if anything, a little too frisky – liable to pull you up to the bumper of the car in front when you least expect it. Power is always intoxicating but in a hybrid it leaves you feeling a little grubby. As if you’ve set out to take a box of tins and bottles for recycling but ended up throwing them in the river instead. Which leaves normal mode, which is perfectly fine for everyday motoring. Tread lightly and the Auris will respond in kind, floor it and it will get up and go. Lift off and the regen is gentle – a little less retardation than you might feel in an ordinary petrol car. When I first saw them I thought the mode buttons were in the wrong place, way down on the centre spar where they can’t easily be seen. In fact they’re in precisely the right place – out of sight as befits something you’ll rarely bother to fiddle with. Back to normal mode. Climb into the car – no need to unlock the TSpirit model I’ve borrowed as it has keyless entry and start. With keyfob in pocket I settle into the Alcantara and leather seat. Correction: I settle onto the seat. It’s a firm perch with shallow bolsters and it feels piano-stool high. Foot on brake and hit the start button: there’s a lightshow on the dashboard but no sound yet, of course. The wheel is lovely but, oddly, has a flat-bottom – as if it belongs in a cramped sports car. Here, there’s ample room for knees, thighs and elbows, and the wheel’s voguish shape merely runs awkwardly through my fingers. 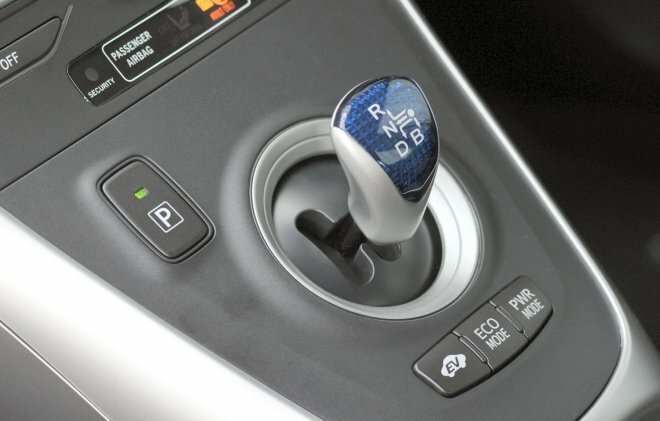 The stubby plastic gear selector is straight out of sister car the Prius, with which the British-built Auris shares its entire petrol-electric powertrain. Pull the lever left and back for drive, left and forward for reverse, left for neutral and straight back for “B”, a hill-descent, extra-regeneration mode. A separate button parks the transmission. Setting off, the car creeps very gently forward of its own volition, on motor alone. With a dose of throttle, unless you floor it, the car will always set off silently using battery power. The engine will fire up and join in as the speed rises, depending on how much you ask of the car. Lift off and the engine will immediately cut out as regeneration begins. A small graphical section of the dashboard, set within the speedometer, can be asked to provide an animation showing power flows between the battery, the engine and wheels. It’s the only real clue as to what’s going on with the engine. There’s no rev counter, and the smoothness with which the engine cuts in and out is uncanny. Only when really pressing on – joining a motorway for example – does the engine note rise and become noticeable. And then, unfortunately, it’s not an especially pleasant noise. At steady speed on the motorway, the engine note is suitably subdued, the wind instead vying with tyre roar depending on the road surface. The £18,950 base model T4 Auris hybrid sits on 15-inch alloys shod with eco rubber, but choose the middle spec or the £20,700 TSpirit model and you’ll get 17-inch wheels wrapped with Michelin Primacy HP tyres: distinctly performance-biased boots. Along with the bigger wheels you’ll get a drop in official economy down to 70.6mpg and 93g/km from the base model’s 74.3mpg and 89g/km. Still astonishingly good figures, of course, and enough for zero-cost tax discs, zero showroom tax and a free pardon from the Congestion Charge. I suspect the smaller wheels and their taller tyres might deliver a more forgiving ride. As it is, with its big wheels and 45-profile tyres, on lowered suspension (fitted to minimise effective frontal area and so reduce aerodynamic drag), the TSpirit feels incongruously firm and sporty. Downsides? The brakes are dramatically over-assisted and completely lifeless, although they are at least linear – there’s no change in feel as the engine cuts out nor as the car switches from regenerative braking to mechanical braking at low speed. Again, Toyota’s engineers have done a grand job of smoothing over the joins. They didn’t manage to work the same subtle magic in the boot. Open up the hatch and you’ll see a large metal label marked “hybrid battery pack”, a little wonkily attached to the carpet with Velcro. It’s presumably there to remind forgetful owners why there’s a big awkward box taking up a third of the cargo area. It’s a hybrid, so it needs a battery pack, and that battery has to go somewhere. It’s here in the boot, so try not to wrench it out or drill holes in it. 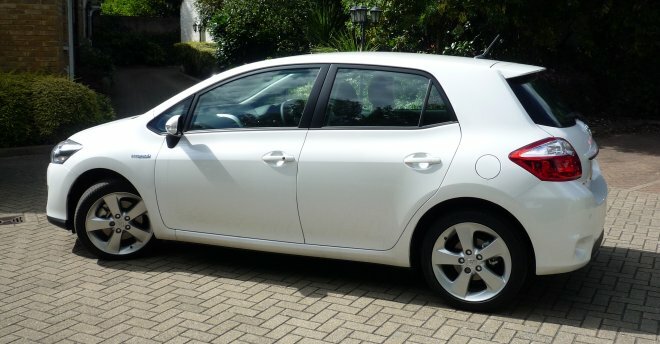 Clearly electrification was not on the agenda when the Auris bodyshell was first hatched, because the layout and details back here are a little iffy. Aft of the battery is a bowl-like plastic liner. Lift it out to get at the spare wheel. Well, I say lift it out, what I mean is heave and wiggle it out while trying not to scratch anything or poke your eye out with its sharp and pointy corners. Above this bowl, once it’s been jimmied back in, sits a false floor that fits flush with the carpeted top of the battery. The false floor folds up like a concertina, particularly when you put your shopping on it. And then there are finger-width crevices between battery and seats down which pens, crayons, coins, toffee wrappers, credit cards and socks will scurry, never to be seen again. So if a capacious boot is high on your list of purchasing criteria, best move along now – there’s nothing to see here. If, however, you’re interested in strikingly low consumption, stay with me. At the end of my week of pootling in and around London Zones 1 and 2, I saw an indicated 55mpg. On the same roads, driving in the same manner in my Honda Civic Hybrid, I’d get perhaps 40 to 45mpg. And driving a similarly sized non-hybrid petrol car I’d expect nothing better than mid thirties. So despite all its quirks and the plethora of features that don’t quite gel, one thing is clear. The Auris hybrid has got it where it counts.